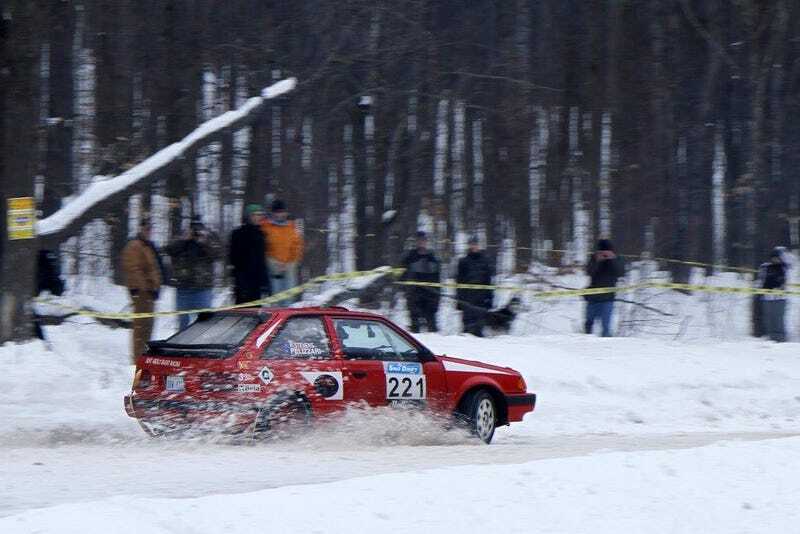 The last time I posted the lil red GTX had just fizzled out after getting clobbered on the rough stages of the 2015 Lake Superior Performance Rally. We had felt pretty good about the new turbo and the set up in general, but then at the very end of stage 12, the car turned off and that was that. We coasted through the finish line and proceeded to scratch our heads - for several hours. We retired the car after service. Turns out, it was the ECU. Something fried, and without going into too much detail, we replaced it with a Megasquirt 2 PNP. Which has been great. It did involve me cutting and soldering all of the wires but they needed to be cleaned up anyway. The car spent a few weeks in Detroit where we got to pull the engine, solder, replace the clutch, eat Polish food, solder, and solder a little more. This was all in a large, dark, and recently painted factory that had been happily provided by a friend and fellow competitor. When I woke up on rally day I, innocently enough, went out to the car to be responsible and check for loose bolts. However, thanks to my fat hands and bulky Carhartt I managed to snap off the frozen plastic bung for the blow off valve. Crap. A couple hours later, a trip down the pipe fitting aisle, and a couple tubes of JB Weld and problem solved. We loaded the tune and 30 minutes later headed to Parc Expose. SnoDrift seems to be either a “love it or hate it” kind of thing. Personally I think it’s fun, though I have yet (fingers VERY crossed) to truly stuff it to the point of shovels, tears, and standing with my hand up holding an OK sign and a tow hook with frozen booties. The weather was nice enough but the actual conditions were very, very icy. The first few stages were the first time I’d really gotten to drive the car with the turbo, new management, etc… It was exciting to say the least. Having grown up in Northern Michigan I’ve driven a few icy roads, and I’ve occasionally stuffed it. I can honestly say that I have never bounced off more snow banks than I have during that first day. All together we did a total of 4 360’s and plowed through many a snow bank. When we reached the final time control, the volunteers – bless their hearts – were laughing because of the sheer amount of snow packed into the front and on top of the car, but we made it. We pulled out 2 other cars while we were at it and tried for a third but failed. Unfortunately, our good will may have backfired a little bit but that’s for Day 2. At the end of Day 1 the car held together great, felt good, and we felt good too. Over all it was exhilarating driving the lil GTX on the ice. Adjusting for the boost via left foot braking and timing took awhile and a couple of spins but in the end I got the hang of it. It’s not that there’s terrible lag, it’s just that there is lag and adjusting turn in, braking, gas, etc… took some getting used to. When it would work the car would let loose and hang it out all the way around the turn, and swing into the next. When it didn’t work all would go quiet as the boost would go “phwoosh” and the car would spin out of my control luckily, mostly, still on the road. Three cheers. Mostly though, it was just great. Having settled in back at the house we had a celebratory beer and went to bed. We finished 11th overall and 5th in class. Our goal though, was to finally finish both days of an event. Day 2 started off with a bit less fanfare than Day 1. We had a doughnut breakfast and drove the car to Parc Expose. That’s it. No breaking important bits, no tuning, no fixing things… it was kind of nice! I had a hankering for a hot dog but couldn’t find one. Only complaint. The weather had warmed up a decent amount which provided much more grip and less treacherous conditions. The stages were great. Fast, flowing, with just enough ice in some spots to keep it interesting. One thing the GTX is not known for is its durability. In fact, on rough stages I’d completely go into what I call “screw you” mode, stick it in 3rd gear at about 2-3k and putter around. The Super Special at Sno-Drift is a gravel pit with an uneven gravel pathway through deep snow. Getting stuck is not fun but also causing even more wear on the trans with 1st and 2nd gear pulls with mixed grip and bumpy shocks does not really fit the bill. So I said “screw it” and proceed to toot around like a grandma. I did this twice. It is not fun. The action is palpable. Having a great crew is pretty incredible and we’ve lucked out to have some pretty awesome mechanics/people come along with us! Like these two dudes! What got us was the 4th from last stage. We were going pretty well when flicking through a blind right downhill to a blind left, we caught a competitor who had apparently gone into a bank and was just getting going again. Now the normal course of action would be to just mash the gas prematurely, let the phwuoosh woosh, swing the car, pray, and Wha LA! Super cool. Since there was an expensive obstacle in the way of option 1, I opted for option 2 and dove into the snow bank. In a moment of half rage and relief, and while the car still hadn’t sunk into the snow, I grabbed reverse and mashed it… then I grabbed 1st, and mashed it… having gotten free we started to chase down the car, we caught it pretty quickly but then as I shifted up, I felt something different… When we passed the car going into a series of tighter turns I could feel something going. Every shift gave off a nice “chrunch”, “chirp”, and other unpleasant mechanical unhappiness… We took it easy the rest of the way, limping through what seemed like an eternity of hell on the next stage, which was an 8-mile version of the gravel pit, being overtaken by 3 cars… the pride not gouda. After what felt like miles of hateful, unrestricted rage covering a broad range of subjects, spewing into my poor co-driver/girlfriend’s ears, my cool was gone, my trans was making terrible sounds, and our only goal was to finish. The next stage I totally assed up a tight left looking for 2nd gear and slid right into a bank. Fortunately, a group of spectators just happened to be having a beer nearby, and immediately came to our aid. Unfortunately, I had stuffed it good... like real good, and reverse only gave off very unpleasant metal-death-kill sounds. Even with a swarm of dudes pushing we were stuck. Luckily another competitor stopped (in the same class no less) and gave us a good yank, popping us out of the snow bank. Without them and the pack of bonfire beer dudes we’d have been pretty S.O.L. With our hatch flapping around without any latches we finished the stage and cautiously ran the last stage Bonfire Alley. We missed out on it last year thanks to a shot voltage regulator. Even when taking it easy, bonfire alley is a sight to behold. Big flames, flying snowballs, flashlights, audible whoopin an hollerin, and the smell of smoke and booze, its a special thing fur shur. We finished 8th Overall and 3rd in Class in the regional Drift Rally. I haven’t won a trophy since skiing in the 4th grade. We’re totally stoked, man. So here we are. Just days from heading out on our next adventure to the 100 Acre Wood Rally in Salem, MO. We swapped the trans for a mystery box that’s so far OK! We’ve been working to get a solid tune with a little more boost to make it just that bit more peppy. Our goal is to be reliable and have fun. We’re pretty close to the first one. woohoo. We’ve gotten a huge amount of help from our local businesses who’ve (for some reason) decided to sponsor the car and can’t thank them enough. From gas money, to t-shirts, to beer, to tires, expertise, or just plain old hard-cash-gas dollars. Ready for 100 Acre Wood!! mostly. ish. We head out Wednesday. My main concerns are water and deeper water but hey whatever right? My lovely co-driver/girlfriend extraordinaire has gotten pretty darn good at the notes thing so it’ll be great to be able to hear each other with our new intercom system. To follow us at the 100 Acre Wood check us out on Facebook or Instagram (Just About Right Racing). Or just come and say “What’s up”, that’d be pretty cool too. We’re Just About Right Racing. <—- it’s pretty self explanatory. Brought to you by our local sponsors... MFD Classic Motors, Mr. Hoxie’s Garage, Bahle Properties Inc, 3 Mile Garage, Mishimoto, The Bluebird Restaurant and Tavern, Roman Wheel Pizza, Empire Outdoors, Mitchell EFI Performance, Punkwerks Rally Sport and the amazing people that make up the rally community here in the good ole U.S. of A.